Parmigianino painted this altarpiece in Rome in 1527 after his arrival from Parma. 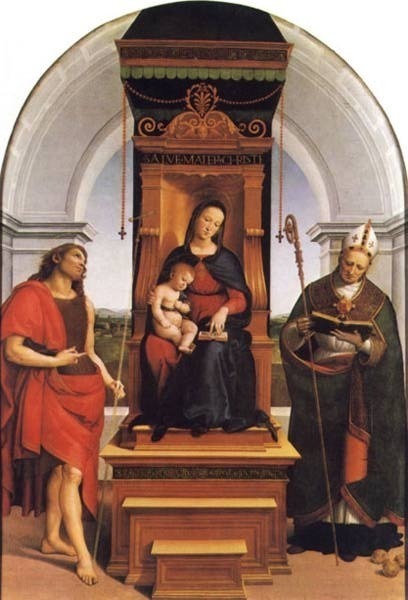 It was his major Roman achievement and is commonly called Vision of St Jerome but the full title is Altarpiece: the Madonna and Child with Saints John the Baptist and Jerome. 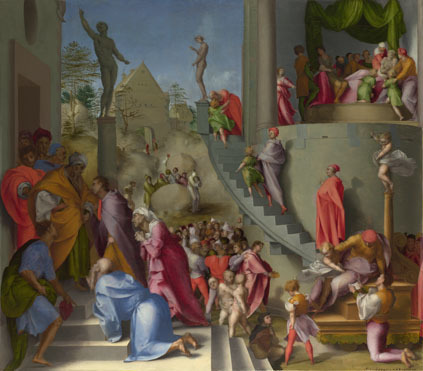 A contract for the altarpiece was discovered by an art historian and indicates that the painting was originally commissioned by Maria Bufalini for her family's chapel at San Salvatore in Lauro, Rome. 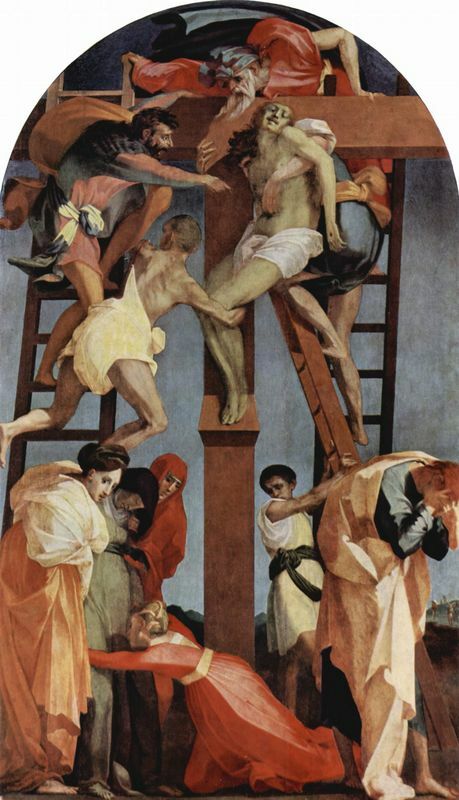 As a condition of the commission, Parmigianino was required to include the two saints in the painting. St John the Baptist was the patron saint of Maria's father-in-law, and as her brother and father were both lawyers, St Jerome was also included because of his association with the law. In this image, heavenly light and clouds surround the sitting Madonna, who holds the Christ child in her arms. Below the Madonna kneels the figure of St John Baptist, dressed in wild animal skins and holding a cross made from reeds, pointing towards Christ. 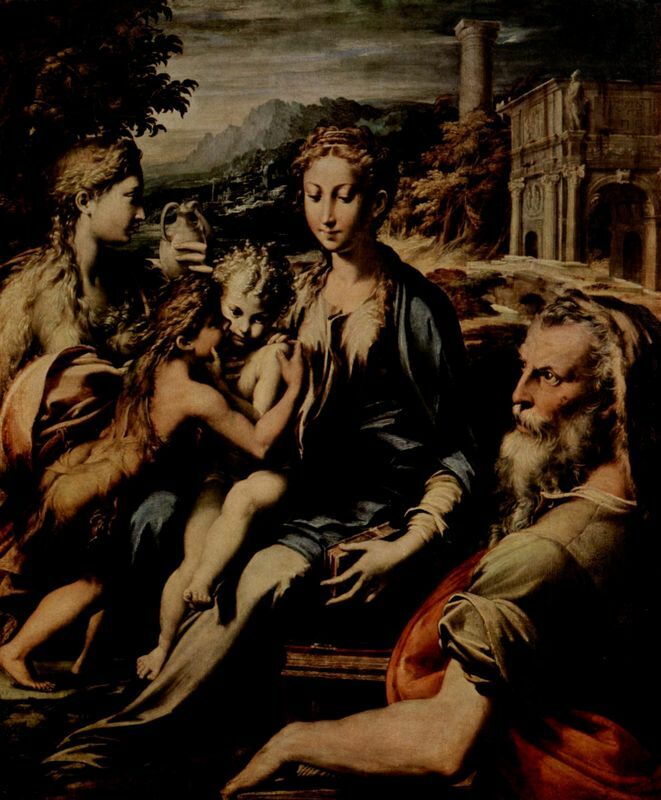 To the right of the Madonna the figure of St Jerome is, unusually, depicted asleep, his hat balanced on a skull. Jerome was one of the most important Church Fathers and biblical scholars of early Christianity. He is best known for having made the first translation of the bible in Latin, the Vulgate. Altarpieces such as this were typically used to provide Christian worshipers with a focus when channeling their devotion to God. Raphael was king of the Madonna theme, and in The Madonna and Child with Saints it is easy to see the influence of Raphael's ideal beauty of form. The painting is so rich and sensuous and is a great example of how Parmigianino was able to show great emotional intensity in his paintings through the use of lighting effects, elongated forms and rich detail. 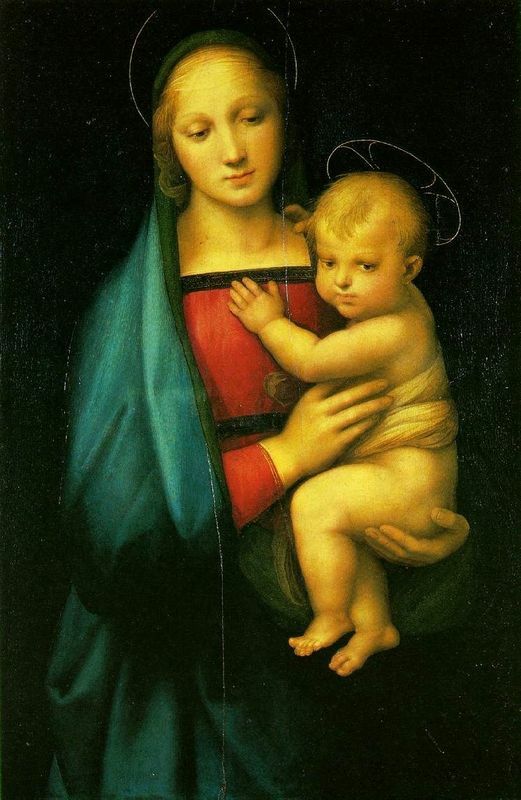 In contrast, Raphael's Madonna's were sweet, tender and subtle in their beauty. His religious works were almost so effortless in their appearance that the viewer would not have connected them with the toil and hard work of the painter. You can see this simple depiction of beauty in Raphael's Madonna dell Granduca (see Related Paintings below). The way that the Madonna's face is ever so slightly shaded, the way the viewer can get only a sense of her body through her flowing wrap, the secure, but tender way she holds Christ Child, the plain background - all of these contribute to the balanced and harmonious composition. There is nothing tense or complicated about the image. 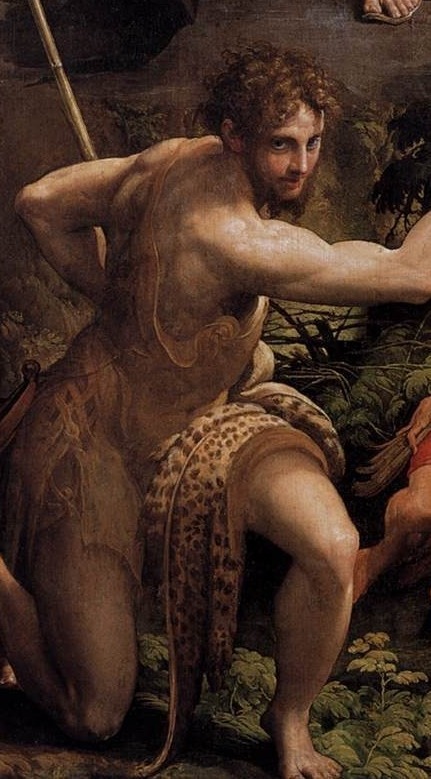 Would Parmigianino's work really have been fit for an altar? Of course, the answer to this question very much depends upon how the painting is viewed. The overt sensuality and beauty could be simply the result of an artist using and celebrating the natural gifts that God has given him, and thus in creating such a beautiful scene he is glorifying God. The main dilemma perhaps is that the sense of artistic pride and mature beauty in the painting clashes with the traditional connotations of Christian humility and modesty. Despite its sensuality, the elegance and beauty in Parmigianino's painting also seems to contain a sense of courtly fashion, and luscious nature. In the background the leaves and foliage have been painted in intricate detail. A glimpse of the sacred Madonna's breasts can be seen through the flimsy and silky fabric of her dress. Her golden hair is gracefully twisted and curled. The Madonna's sensuous beauty very much conflicts with her modest downward gaze. The Saint's bodies are also muscular and refined in their poises. Parmigianino has chosen to separate the two saints in the painting. 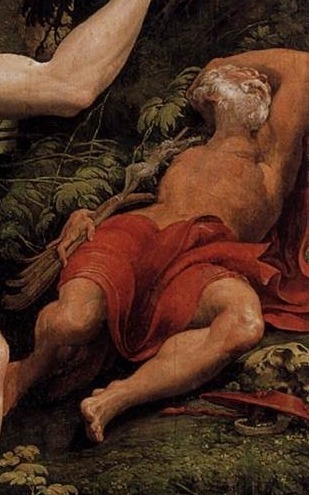 St John Baptist dominates the left-hand corner of the picture, whilst St Jerome is asleep in the right-hand corner, suggesting that the picture could be a vision from his dreams. Whereas Jerome is very muscular and active, lunging towards us and asking us to respond to the scene to which he points, John is a smaller, slightly disengaged background figure. The complex and exaggerated pose of the Baptist and his unusually elongated fingers are all typical of the Mannerist style. His questioning look very much demands us to respond to the picture. He forces us to notice and appreciate the Madonna. Although she is still positioned high up in the painting, she is still in the background - not even the mother of Christ can occupy a more splendid place than in a Saint's mind and spirit. 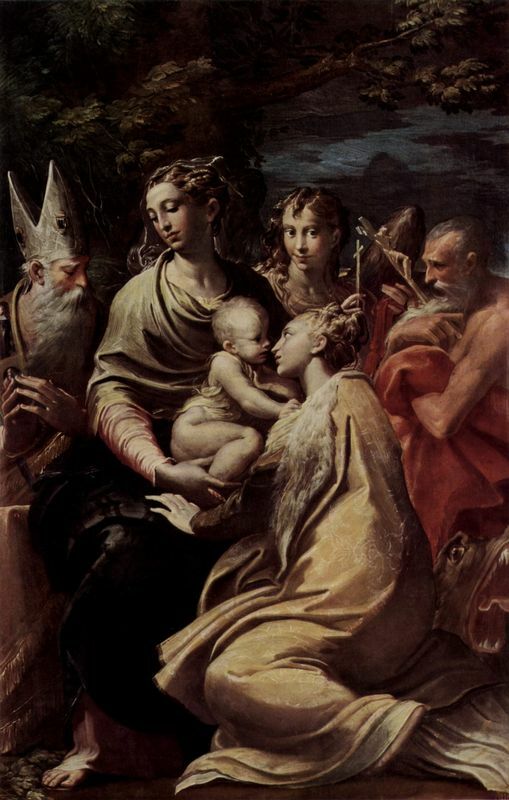 In Virgin and Child with Saints (see Related Paintings below), which was an early study for The Madonna and Child with Saints, you can see that Parmigianino played around with the composition before deciding on the final layout for the painting. 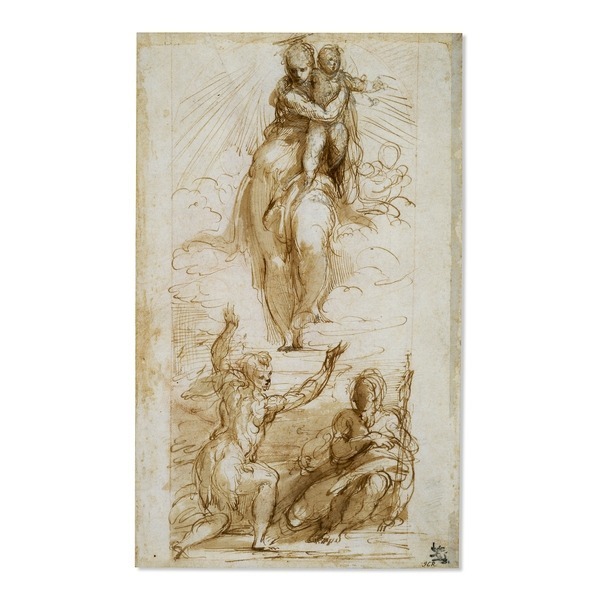 Drawn initially with red chalk, Parmigianino layered the image with pen and finished with a brown wash. The hatching and cross-hatching of lines gives the impression of light and shade. The short and sharp pen strokes give movement and shape to the figures. The overt sensuality of works such as The Madonna and Child with Saints has led some critics to suggest that his work is blasphemous and disrespectful to the church and that he was a closet atheist. Many of his religious images have a sense of frivolous sensuality and because of this appear insincere and often seem to lack a sense of piety. 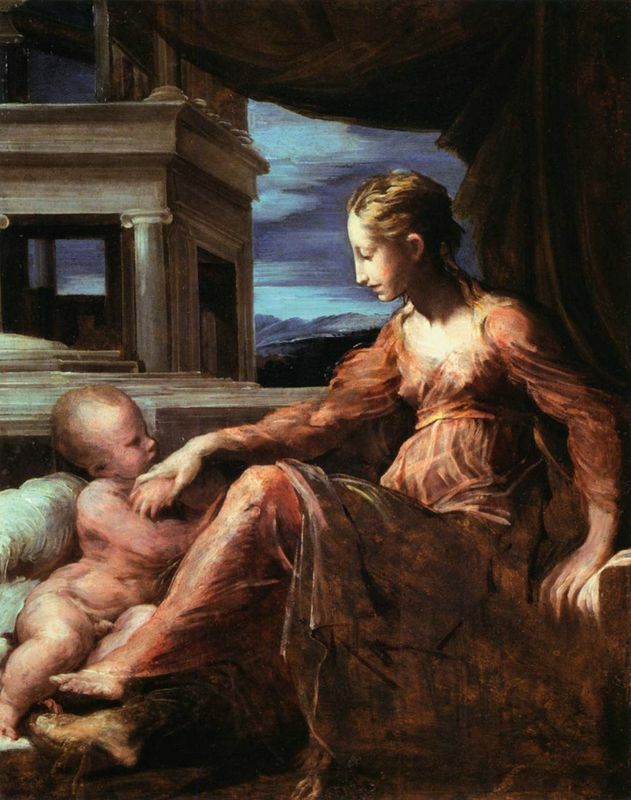 Some of Parmigianino's work, in particular the graceful Madonna's, seems to navigate a difficult path between spiritual fulfillment and the more obvious visual pleasure in the image. They seem to be trying to capture and translate a set of differing meanings from a sense of the divine to aesthetic satisfaction and aristocratic etiquette. 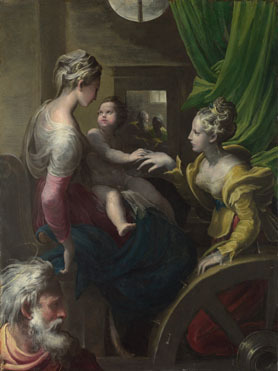 Yet, Parmigianino was one of the Italian Renaissance's great geniuses and was not afraid to push boundaries and break with convention; it was this daring streak that paved the way for other bold artists to continue in the same vein and therefore it is no wonder that contemporary art critics christened Parmigianino the 'Prince of Mannerism'.